Saturday night was Date Night and my husband and I were, as usual, out entirely way too late being up to no good and we were walking along the streets and alleys of downtown CoMO when I spotted the graffiti pictured up there. It stopped me dead in my tracks. We can get so caught up in the minutia of our lives that we forget that it really, truly is good to be here. We live in a world where nearly everything is possible. You are sitting here reading this right now on a computer or a phone or a tablet that is connecting us around the world by invisible connections in space. You are loved. You are alive. You can feel the air on your skin. You woke up on this side of the dirt this morning. 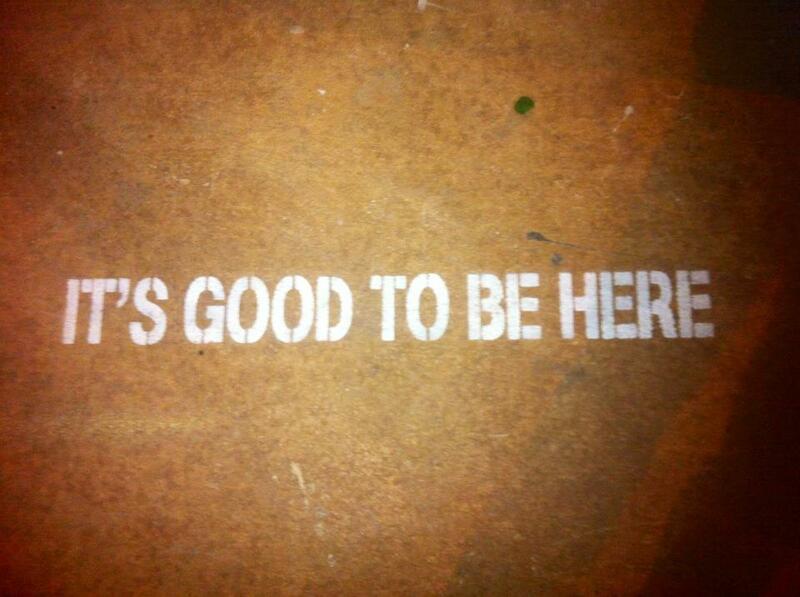 It’s good to be here, indeed. I was so moved by this message sent by an anonymous sage that I used it as the theme for my next three yoga classes. If you’ve ever wanted to take one of my classes but couldn’t make it, here’s your chance to experience a tiny bit. Press your palms together (Anjali Mudra) and then bring your hands to Anahata (press your thumbs to your sternum.) As you breathe deeply, inhale and feel your heart chakra lift up and press into your thumbs, exhale and feel your back body grounding. Visualize a ball of light forming right inside you, right behind your thumbs. Breathe in and see that ball begin to glow and expand like fire does when fanned with oxygen. Breathe out and see the glow grow to encompass your whole body. As it glows, begin to ad a little movement. Inhale your arms over head, palms pressed together. Exhale and draw your arms out in a circle around you until they come back to heart. Reverse the process: inhale arms out and up the exhale hands to heart. Repeat 5 more times. Visualize the light encompassing you, circling you. Then imagine it reaching beyond you to encompass your neighbor. Then the town. Then your state. Then the country. Then the entire world. This light is your light, your life, your passion, your grace, your joy, your uniqueness, your Prana. No matter where you go or what you do, that light is within you. That light is you. That light is who you are. That light is WHERE you are. Always. Don't want to miss a thing? Don't blame you!